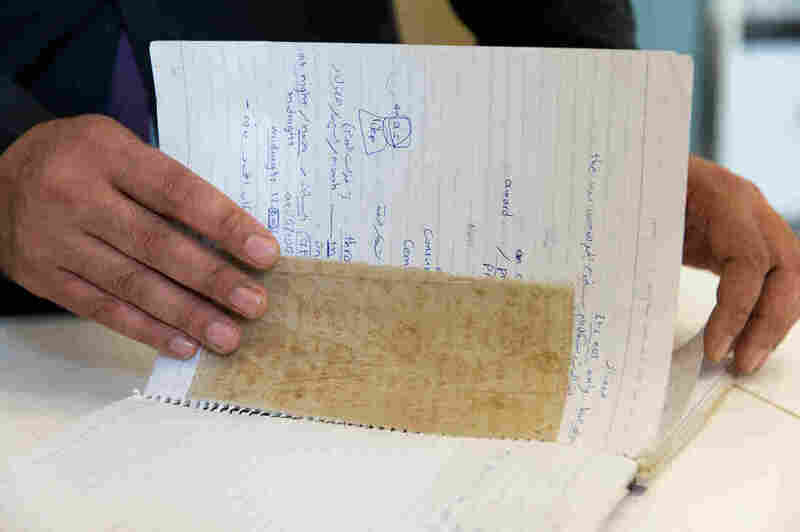 Pieces of cloth that Mansour Omari and other inmates at a notorious Syrian prison used to document the names of the "disappeared" held with them. They made ink out of blood from their bleeding gums and rust from the prison bars. Mansour Omari had been held nearly a year in an underground Syrian prison, tortured and starved, when his name was called by the guards. He was going to be released. The other prisoners hugged him and wept. In the dark, they whispered, "Don't forget us." Omari would not forget. When he was eventually set free in 2013, he smuggled out the names of all 82 inmates. The lists were written on torn pieces of clothing and penned in blood, then sewn into the collar and cuffs of his shirt. It was his duty, he says, to make sure the names saw the light of day. The five pieces of fabric are now part of a new exhibit at the U.S. 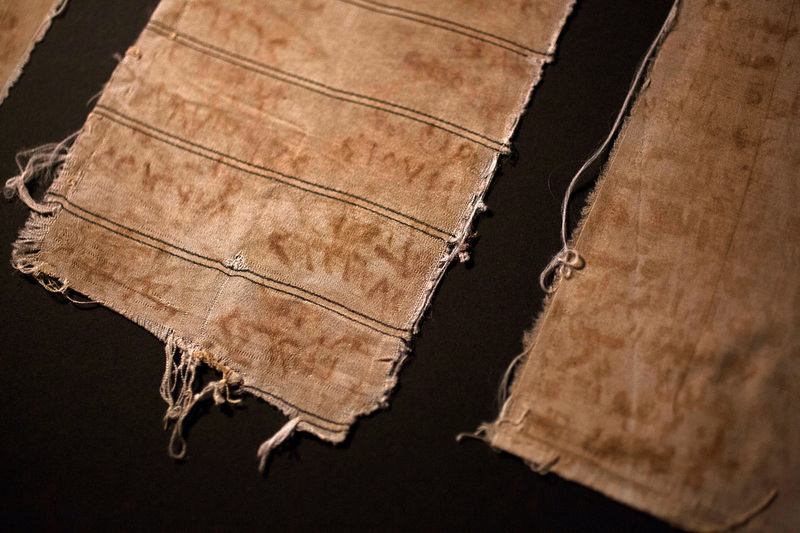 Holocaust Memorial Museum in Washington, D.C. Omari lent the tattered cloth to the museum to keep attention on the tens of thousands of Syrians who have disappeared since President Bashar Assad stepped up his crackdown on his critics in 2011. Omari, a journalist and activist, was picked up by the Syrian military police in 2012 and imprisoned for nearly a year. The government just takes people, says Omari, a broad-shouldered, soft-spoken man. One day, people are simply gone and never heard from again, the 38-year-old says. "We have this proverb in Syria that can be translated into 'disappeared beyond the sun,' " Omari tells NPR's Rachel Martin. "That means when you say any word against the government or the government doesn't like you, you will disappear. ... Nobody will know about you and you will be in darkness." Omari, a journalist and activist, was working for the Syrian Center for Media and Freedom of Expression when he was picked up by the military police in 2012. 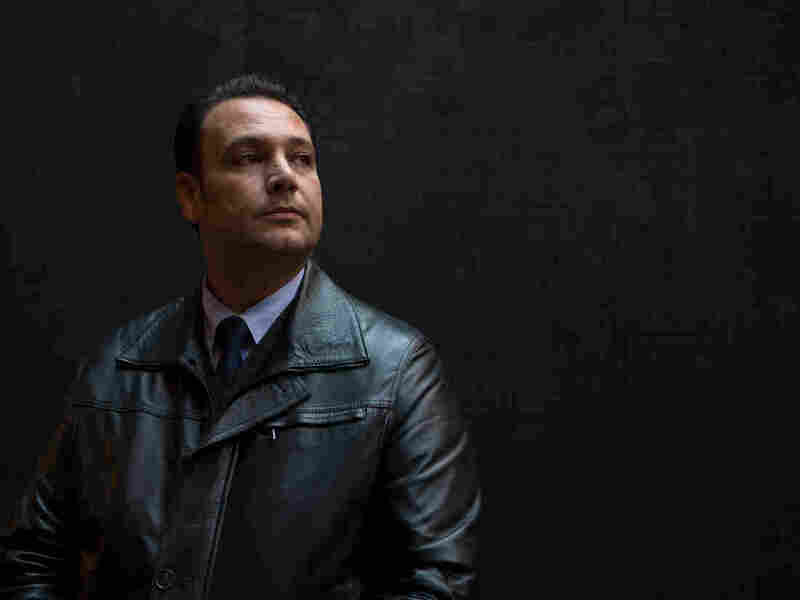 He was taken to one of the regime's most notorious prisons — run by Maher Assad, the Syrian president's brother — and held three stories underground. Conditions at the makeshift prison in a military installation were horrific. There wasn't enough space for everyone to lie down, so the men slept in shifts. Food was scarce; breakfast was three olives and some bread. Omari says he lost more than 70 pounds during his detention. For nine months, he didn't see the sun. "You turn into a skeleton inside," Omari says. "You lose all your flesh, you stay bones and your skin. That's all you're left with you. Your skin is covered with wounds because of the beatings, and blisters and scabies." Omari, who had once worked to document the names of the disappeared, was now one of them. If he could write down the names, and smuggle them out, he says, the men's families could learn of their fate and the world could know of the atrocities being committed. Five of the prisoners worked in secret. With nothing to write with, or write on, they had to be resourceful. They found that the most durable ink was spit and blood from their bleeding gums, mixed with rust scraped from the bars of the cell. A splintered chicken bone — food scraps left over from the guards — worked as a quill. Nabil Shurbaji, a Syrian journalist, was the prisoner with the best handwriting. He was chosen to pen the names on bits of fabric cut from their shirts. In secret, one of the men, a tailor, did his best to sew the fabric under the collar and cuffs of a shirt. The prisoners had no needles, so the tailor pierced the cloth with sharp bones and weaved bits of thread through holes to attach them. The five agreed that the first one to be released would wear the shirt out of prison. After being held for nine months, Omari's name was called. He believes that pressure from the media and human rights groups secured his release. It did not stop him from being tortured, he says, but it saved his life. Omari says he had mixed feelings about leaving the prison. "I was scared because I'm wearing the shirt, and I don't know if I'll be searched," says Omari. "And I was saying goodbye to my friends. I spent a long time with them." Once free, Omari began to search for the families of the men he was imprisoned with. It was not easy: More than 11 million Syrians have been displaced since the start of the civil war. Once he found the families, Omari had to convince them that he wasn't a government spy. "Many of them, it was the first time they knew anything about their sons," says Omari. "And they don't believe me. Because it was a shock for them. It's like been maybe years they didn't hear anything about their sons. And I come, like, out of nowhere, and telling them, 'Hi, I was with your son, and he's alive.' And that was shocking for them, of course." Omari says the conversations were painful and that he kept the most gruesome details to himself. After his release four years ago, Omari left for Turkey. He was later given refugee status in Sweden, where he now lives. 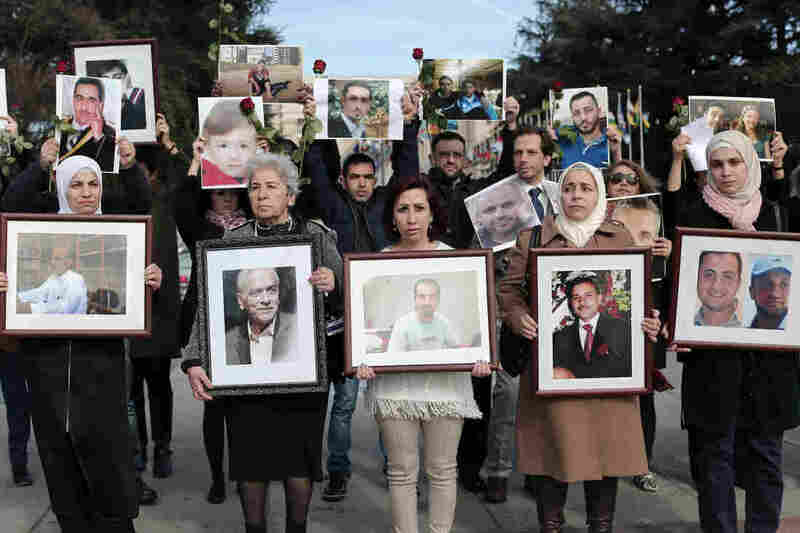 His efforts to expose the Syrian regime are featured in a documentary, "Syria's Disappeared." "The sheer heroism of what Mansour did is what drew us to the story," Sara Afshar, the film's director who attended the recent opening of the Holocaust Museum exhibit, wrote in an email. "We were also drawn to the story because the film (as a whole) looks at the importance of documentation in trying to get justice for survivors and the families of the tortured and disappeared." Omari continues to work on behalf of the disappeared and to find out what happened to the men whose names he smuggled out. But of the 82 names, he has only been able to confirm what happened to 11 of the men. Four, including Nabil Shurbaji, who wrote the names, died in prison. The other seven were either released or sent to other prisons. A piece of cloth and a notebook Omari donated to the U.S. Holocaust Memorial Museum in Washington, D.C.
Digital imaging has captured the names, but the words in red won't last forever, says Jane Klinger, the Holocaust Museum's chief conservator. The fabric is now being kept at a constant temperature and away from light, but the rust and blood are breaking down. "Any direct conservation treatment known will not be able to fully halt or mitigate the fading," Klinger says. Nevertheless, the exhibition is proof that those still being held in Syria's prisons have not been forgotten. During the interview, Omari pats his jacket sleeves as if feeling for the names he has kept safe for the past five years. And he feels he has lived up to his promise to tell their story. But Omari is grieving. He feels guilty that he was freed, while his friends stayed behind. And he believes some of the detainees are still alive and are being held in Syria's brutal detention centers. "They think that if the world knew exactly what they are suffering, the world would not stand and look," he says. "The world would help." "I don't know what to tell them now, after what has happened in Syria," he says, "and nobody's doing anything."